Konstantinos THOMAIDIS, Do mantle xenoliths preserved water signature from the lithospheric mantle and how ? An experimental et numerical approach . Thesis started in 2018. 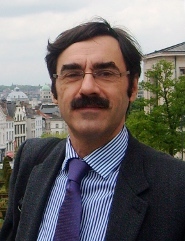 Other co-advisor: Pierre HIREL. Huan Chen, The role of the Pacific subduction in the genesis of Cenozoic basalts in eastern China: New constrains from water content and oxygen isotope composition. Thesis defended in 2017. Other co-advisor: XIA Qunke. Present position: Post-doctorat à l'Université de Zhejiang, Hangzhou, Chine (grant from the Chinese “Postdoctoral Innovative Talent Program”). Xiaoyan Gu, Melt-rock interaction signatures in peridotite from sub-continental mantle (French Massif Central) : A trace element, H, Li and δ7Li approach (thèse de l'université de Lorraine). Thesis defended in 2016. Other co-advisor: Etienne Deloule. Present position: Post-doctorat à l'Université de Zhejiang, Hangzhou, Chine. Peipei Zhang, Hydrogen diffusion in NAMs : andradite garnet and zircon. Thesis defended in 2015. Other co-advisor: Qun-Ke Xia. Present position: Post-doc à l'Université Sciences et Techniques de Chine au 1er Avril 2015. Eric Vigouroux, Hydrogen diffusivity in wadsleyite : estimation of the water content in the transition zone of the earth's mantle . Thesis defended in 2014. Present position: Research fellow, Department of Earth Sciences, Kasetsart University, Bangkok, Thailande. 4 seminars. 35 oral presentation(s), including 4 invited. 16 poster(s). Detailled list.